By now it’s old news that the internet is full of Fake News, pumped into our social media channels by Russian trolls. But while the majority of our attention has been focused on whether the Trump campaign colluded with Russia during the 2016 election, the full extent of Russia’s meddling goes beyond electioneering. A report released last week by the House Science, Space, and Technology Committee outlines how a Russian internet company used Facebook, Instagram and Twitter to spread over 9,000 inflammatory, misinformation-filled posts about U.S. energy policy and climate change, attacking both liberals and conservatives alike. 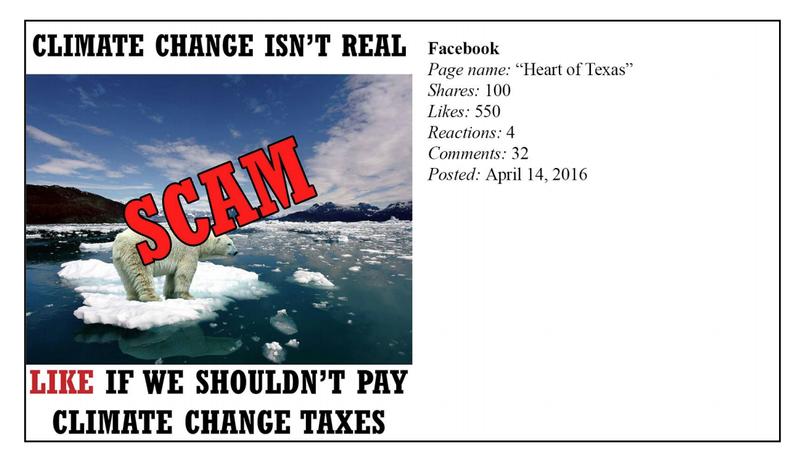 While some of these memes are comically bad (who knew polar bears were scam artists?!) spreading misinformation into the climate change debate is all to real of an issue. According to the Yale Program on Climate Change Communication, only about 70% of American adults believe that climate change is happening, and only about half believe that global warming is caused by humans. Our President and much of the Republican party is hesitant to act to reduce fossil fuel emissions, and many refuse to even acknowledge the legitimacy that climate change is a real problem. It’s funny, but also it’s not funny. What makes the Russian memes so sinister is that they’re not directly aimed at turning environmentalists into deniers or vice versa (there’s actually plenty of pro-environment messaging in the mix), but rather their goal seems to be to create chaos across the U.S. The report from the House Committee spells out that much of the propaganda is meant to simply “generate further domestic controversy surrounding the issue of climate change.” Essentially, just get a buch of dumb Americans yelling at each other. Maybe it seems that sharing a post highlighting the idiocy of conflating weather and climate would be helpful for the climate change discussion, but research has suggested that pounding someone with arguments, whether they’re filled with data or emotion, is unlikely to convince a denier that climate change is a real issue. Instead, the way to combat misinformation likely lies more in understanding the context behind someone’s belief. The issue is that these Russian produced memes (and much of social media in general) do the exact opposite. They criticize, mock, attack and villainize without proposing solutions and without a chance in hell of convincing anyone of anything new. When was the last time you convinced someone you were right by screaming at them that they we’re stupid? If we want to start convincing deniers to change their views, we need to have real conversations.